We would love to hear your thoughts on Dallas ISD and how you feel we can influence change. If you would like Dustin to appear for an interview, conference, or local town meeting, let us know! While we want to address the concerns of every parent, teacher, student, and community member, we can’t speak to all of you at once. Please fill out the form below and send us a message. Our friendly staff will make sure to get back to you within 24 hours. Dallas ISD is the largest employer in Dallas with 227 schools, approximately 160,000 students, and nearly 20,000 employees! We want to help make the district and the community stronger, and we’d love your support. Send us a message with the form on the right, and include your zip code so we can get an idea of where the messages are coming from. We’ll get back to you within 24 hours. 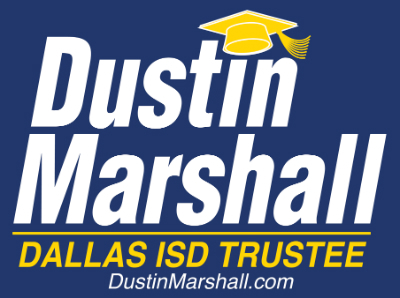 Please complete this form for more information about Dustin Marshall and his position and approach as it pertains to you and your community.